Since almost every house has a ceramic floor located somewhere in the home, the question of effective ways of cleaning ceramic floor tile is quite common. 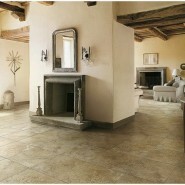 Ceramic is a manufactured floor tile that employs baking process in a kiln. Ceramic floor tiles come in three basic types. Glazed and Semi-Glazed ceramic tiles are generally easier to clean than unglazed because a silicate coating is applied to ceramic floor during the manufacturing process to the ceramic tile. This coating reduces and/or eliminates soil from penetrating into the pores of the ceramic making it easier to clean. However, even glazed ceramic tiles require cleaning to remove surface soils and dirt. If using more common methods for daily or routine ceramic floor cleaning is the topic you are interested in, please visit a prior article written on cleaning ceramic floor tile – (Ceramic Tile Floor Cleaning – Daily Cleaning Residential & New Product Innovation). How they work and some advantages of steam floor mops are outlined below. A steam floor mop generates steam which is applied to the ceramic floor and most steam floor mops also employ a microfiber pad to assist in the cleaning process. The steam loosens, penetrates the soil while the microfiber pad agitates the ceramic tile and captures and taps the soil into the pad. Usually it takes only one pass to accomplish the cleaning task which makes it a fast quicker way of cleaning. Steam Floor Mops use only water to generate the steam and require no chemicals to provide cleaning. No cleaning products and using water only is a green and safer way for cleaning ceramic floor tile while cleaning without cleaning chemicals will also save the consumer a considerable amount of money. Another benefit for some steam floor mops is that they actually sanitize the floor surface.